The New Leaf is a perfect story to introduce idioms (figures of speech) to young children and English language learners. 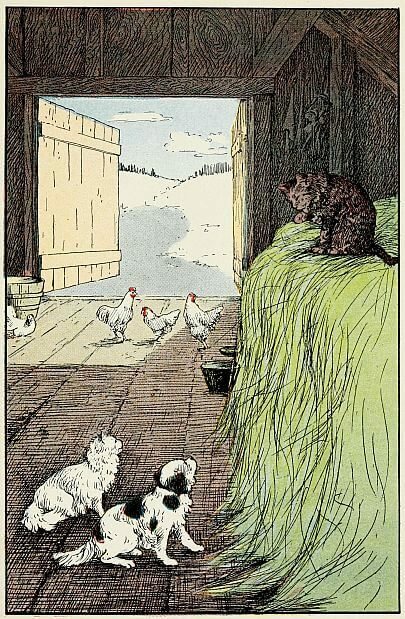 Published in Three Minute Stories , illustrations by Josephine H. Bruce (1914). “Why are you crying, Little Cat?” asked Little Dog. “One what?” asked Little Dog. They found Old Cat in the Barn sitting on a truss of hay, washing herself. She listened to Little Cat’s story, and her green eyes twinkled. “So you have been looking for new leaves under the snow!” she said. “How many rats have you caught this week?” asked Old Cat, turning to Little Dog. If you enjoy this story, you will find plenty of idioms and short story lessons in Aesop's fables. An example is the expression, "in a pinch" used in the Aesop story, The Crow and the Pitcher. Add The New Leaf to your own personal library.